Haukivesi is a lake in southeastern Finland and a part of the Saimaa lake system. Haukivesi is the central basin of the system, collecting 80% of the water that eventually flows into Lake Ladoga through River Vuoksi. Its area is 562.31 square kilometres . Like other lakes in the system, it has a convoluted shoreline with numerous islands and is divided into a number of smaller regions such as Siitinselkä, Saviluoto, Tahkoselkä, Vuoriselkä, Kuokanselkä, Kuivaselkä, Heposelkä, Peonselkä, Tuunaanselkä, Hiekonselkä, Varparannanselkä, and Iso-Haukivesi. Haukivesi stretches from Varkaus to Savonlinna in a northeast-southwest direction. The northern part is shallow, at less than 20 metres , but deepens toward the southeast, up to 60 metres at Kuivaselkä. Most water flows from the east, through Tappuvirta, Oravikoski and Haponlahti locks. A smaller inflow is from the north, through Pirtinvirta in Varkaus. 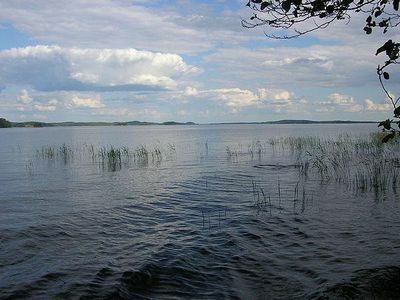 Of the lakes in the Saimaa lake system, Haukivesi receives the most nutrients. The water quality varies with location, because of the differences between the water qualities of the inflows. In Haukivesi, more nutrient-rich water flowing from the north mixes with purer waters from the east. The largest individual pollution sources are the city of Varkaus and its pulp mills, although smaller settlements and diffuse pollution from agriculture and forestry contribute. The lake was heavily polluted by the pulp mills up to the 70s, but stricter regulation forced the mills to treat their wastewaters, and thus the lake recovered.